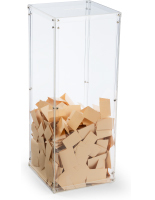 These acrylic ballot boxes, comment boxes, suggestion boxes, donation boxes, and collection boxes serve a number of different uses. 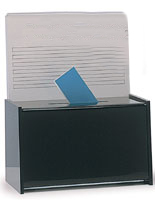 These voting boxes can be used in businesses, in clubs, organizations, non-profits, or even at home! 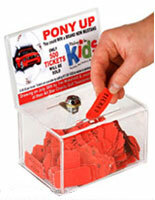 Get people involved, ask for their input, collect their thoughts, collect their donations, or have a raffle. 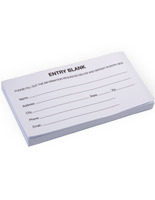 With so many options, these entry boxes enable you or your business to integrate other people and let them contribute to the whole organization. Whether it's a comment, donation, suggestion, or entry - it makes other people feel good to be involved. 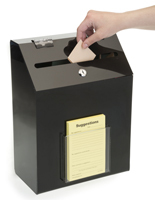 Entry boxes are a great way to assist you with your polling station and gather votes. Some of our entry boxes with graphic holders and literature/ballot pockets are all inclusive packages making for a very convenient display. Some of the merchandise can be locked as well for added security. 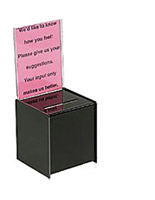 For comments and ideas on how to improve service there is no better way to get direct customer feedback than from a suggestion box. 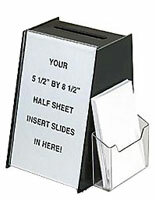 Acrylic ballot boxes make terrific acrylic displays and can be quite beneficial to your business, charity or organization. 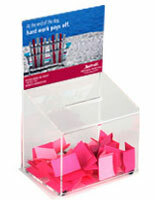 A voting bin simplifies collections for suggestion, registration, lead boxes, charity collection boxes or contests. 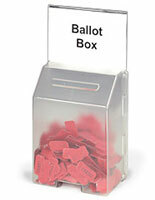 These acrylic ballot boxes come in a variety of sizes to suit your needs. 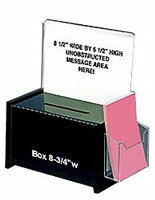 Some ballot boxes have displays for signs and pockets for suggestion forms or brochures. 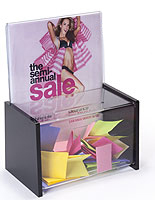 With these Acrylic products, your marketing and promotion options are endless. 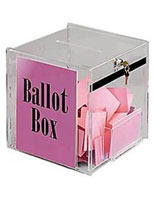 Looking for something to collect information or a ballot box that won’t take up a significant amount of space? 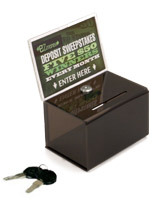 These entry boxes have a smaller design to help conserve space on desks and countertops. 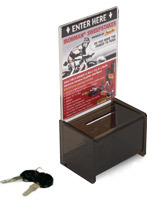 These acrylic displays often feature a locking design with keyed entry. 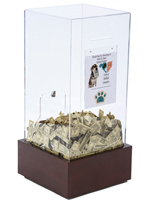 Keep ballots or monetary donations safe. Most of the displays in this category also feature a custom header. 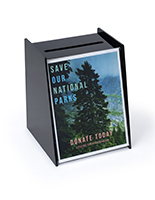 Place your own signage over the top of this acrylic entry box to advertise a specific cause or notify people of the box’s purpose. 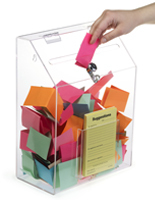 These suggestion bins are available in several different colors. 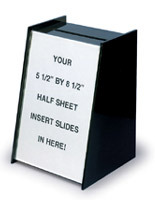 Purchase these entry boxes in black, translucent or white to match any décor. 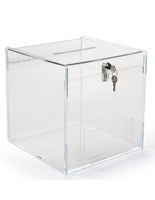 What are some advantages of these acrylic entry boxes? Having communication issues in the office? 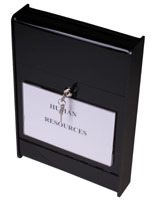 An entry box can help employees communicate more easily with upper management. 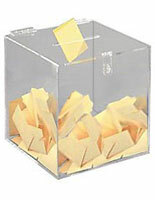 Have employees place complaints into the acrylic ballot holder and managers can address them in due time. This way, workers do not have to directly speak with the manager, or openly talk about complaints. While email is also a discreet way to notify an individual in the office, no complaints can be made anonymous. 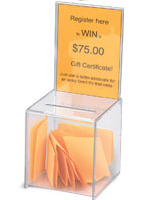 With a donation box, employees can draw attention to specific issues that they may want to avoid associating their name with. Also use these displays for schools. 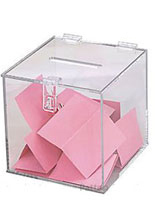 Hold classroom votes or student elections. 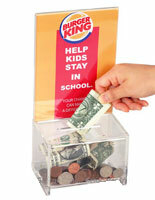 Leave this donation bin out by the front office to collect money for a specific cause. 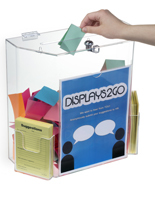 With so many different uses, these displays are ideal for a school setting. 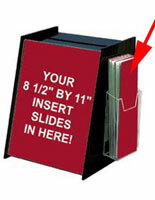 The smaller size of this box is very convenient for classrooms. Conserve extra space for learning materials and other important items. 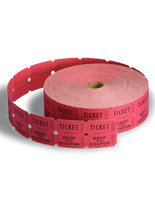 Need an efficient way to collect votes for prom king and queen? 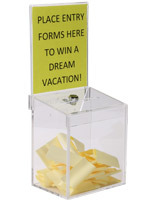 With a suggestion box students have the ability to vote in between classes and working periods. 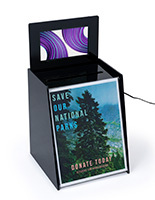 A central location like the office, cafeteria or library will work great. 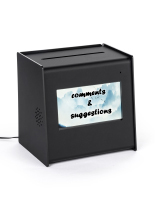 Where can suggestion and entry boxes be used? 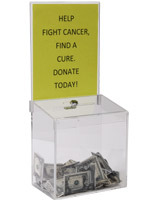 With a custom header, collecting donations becomes a much easier task. Create a clever and appealing header to draw people in. 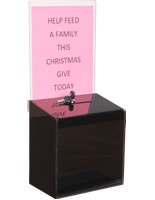 With clear acrylic bins, people can see money has already been collected and can prompt people to donate themselves. Advertising with custom signage is one of the easiest ways to draw people in. 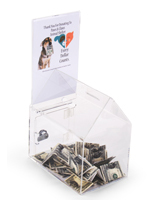 Try placing a bin near an area where people will have spare change to give, like near a cash register. 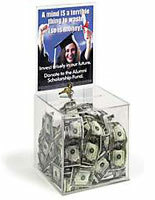 With good advertising, most people are more likely to donate their extra spare change than keep it in their pocket! 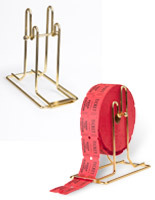 The main category also offers a full of spectrum of prize wheels, raffle drums and floor standing ballot boxes. 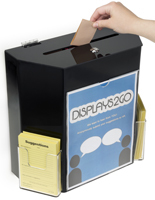 These displays are a great way to promote at large events. 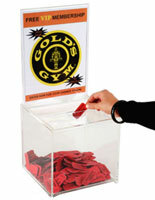 Prize wheels are noisy displays that can draw in the attention need to gain crowds at trade show booths. 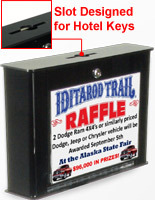 Raffle drums are useful tools for large scale giveaways and sweepstakes. 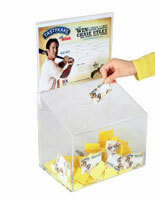 Get crowds excited to participate with these large raffle tumblers.